Back in high school I went through a phase where I couldn't stand how shiny my skin would get. I was washing it 3x daily, applying a mattifying gel lotion over top, and overdosing on gel spot treatment for any visible blemishes. My makeup looked cakey, my skin was flaky, and most of all, my skin was red, blotchy, and super sensitive. I vividly remember the first day I decided to ditch the "oily skin" products and dive into my stash of serums and moisturizer samples that I had started to collect from Sephora orders. After only one day of using a moisturizer containing oil, I was hooked. Next came a daily Argan oil serum, and within one week my skin had repaired itself to a whole new level of radiance and clarity. Ever since, I've barely skipped a day of rich moisturizer or straight-up oil since my sensitive, dehydrated skin craves it. I wash once daily, at night (just a splash of water works for me in the morning) and I always look forward to a quick face massage before bed using one of these sacred oils. The L'Occitane Immortelle range is extremely popular worldwide, with one of their most well known products being the Divine Cream. I tried a small pot of it two years ago, and was so close to buying the full size. These products are expensive, but the results are there to justify it. Targeted towards damaged or aging skin, the Immortelle Divine Youth Oil is flying off the shelves. It's never too early to start defending your skin against signs of aging, especially since the majority of our sun damage happens before age 20. I was so excited to receive the Immortelle 28-Day Divine Renewal Program, which you can see the details of in these photos. This beautiful gold box includes 28 small packets of oil, with a different blend of ingredients for each week. Week 1 - Exfoliation, Week 2 - Hydration, Week 3 - Balance, Week 4 - Renewal. Each week contains the same base of Immortelle flower oil, then varies with the addition of ingredients like mastic leaf oil, evening primrose seed oil, rosemary leaf oil, and carrot seed oil. Here are my results, with one photo taken right at the beginning of week 1, 2, 3 and at the end of week 4. Since I've been using repairing oils for years now, there is no major difference in the look or feel of my skin. This is great news since I didn't use any serum or moisturizer in conjunction with this daily oil, and my routine is typically quite detailed. If you have red, damaged, dehydrated or aging skin, I can almost guarantee that you will notice a massive difference with daily use of this divine oil program. I love how the daily dose holds you accountable and doesn't let you skip the repairing massage routine. These small plastic capsules are made of very thick plastic and don't dispense oil very well. I had best results cutting off the top instead of snapping it open, and I ended up having multiple packets left after each week. This is not a ripoff considering the price and effectiveness of the other Immortelle products, I just wish the brand would have provided 4 separate bottles of oil so you are able to dispense your own customized amount each day. 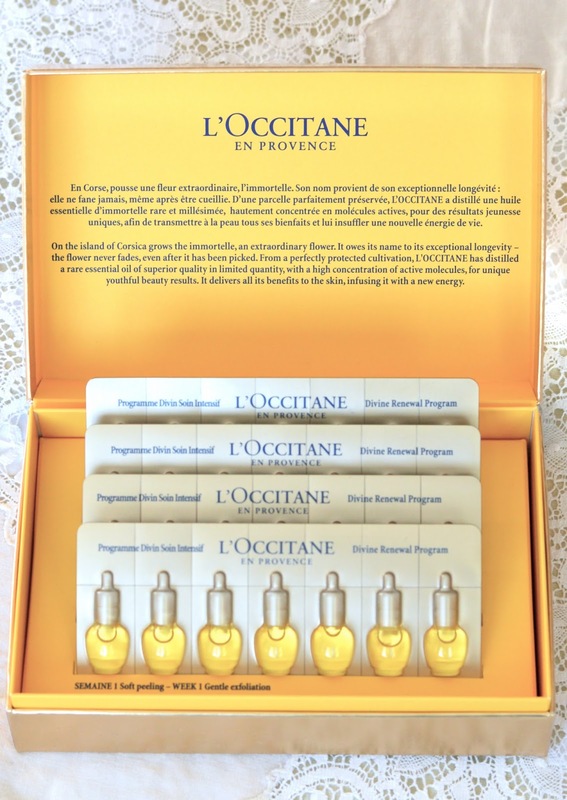 You can click here to purchase the Divine Renewal Program from L'Occitane Canada.